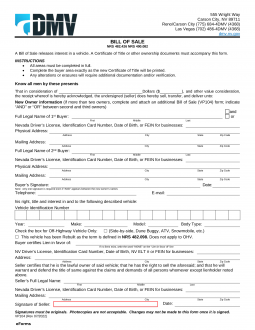 The Nevada Bill of Sale Forms are considered legal documents in the state of Nevada. These documents will provide information with regard to the sellers, buyers, and the vehicles, vessels, firearms or any other items being sold and purchased. As well, the documents will not only provide proof of legal sale and purchase but also change of ownership. Some documents will require notarization. General Bill of Sale – This document will provide proof of sale of personal items between two private parties. Gun Bill of Sale – Would be used to show that a legal sale of a firearm has been transacted and will provide all necessary information for identifying the firearm. Vehicle Bill of Sale – Will be used to prove the legal sale and purchase of a motor vehicle in the state of Nevada. Will also provide information about the vehicle and prove change of ownership. Vessel Bill of Sale – Required in order to process the transfer with the State and prove ownership. An Original Manufacturer’s Statement of Origin (MSO) – (If you have no Hull ID or MSO, you must have your boat/vessel inspected at your local NDOW location – The Carson City location will not inspect – all of the other locations will.